Russians control one TWO thirds of Georgia? I just got off a bloggers' conference call with people from Radio Free Europe -- through the Heritage Foundation, by way of CaseForFreedom.org. I don't know what I can tell you; it sounds like complete chaos. It was very frightening, really. 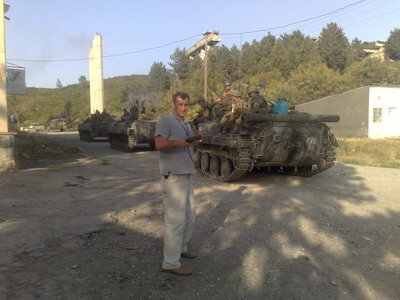 The Georgian president is claiming that Russia has occupied two-thirds of the country of Georgia, and I listened as a reporter on the ground in Georgia spoke to us from his cell phone, watching Russian tanks pouring in. "I see one, two, three, four..." Then four more. "They are coming and coming." I may be wrong, as I understood only a portion of what was being said, but I believe this means the Russian army is not withdrawing, but is actually still aggressive. The reporter was, I believe, 12 kms. east of Gori, and the tanks would thus have 40 kms. left to Tbilisi, the capital and largest city of Georgia. 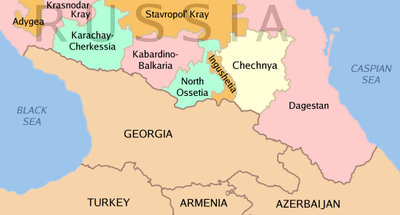 It is too early to ascertain the extent of the invasion, but Russia has attacked up to 500 kms further into Georgia than South Ossetia, at ports on the Black Sea. And a factory in Tbilisi has been bombed. While the Russian army had the city of Gori completely encircled, para-military "irregulars" from the northern Caucases -from places such as Chechnya and Ingushetia- were looting vacant homes after approximately 80% of the population had fled. The Ingush and Chechens are predominantly Sunni Muslim, but the folks on the phone were talking about Cossacks. Go figure. Turkish, Georgian and Czech journalists have been attacked, but I don't think anyone knows if this is a significant (i.e. intentional) pattern. Today is "much calmer" in Gori, but even cell phones are out there. Russian generals are threatening to move missiles to aim at Ukraine, and there has been "talk" among them of targeting Poland. As we could have guessed, Putin will not accept Ukrainian or Georgian membership in NATO. Russian media showing only victorious Russian army "liberating" South Ossetia, while Georgian public television is documenting Russian atrocities. Jerry Gordon asked about the oil pipeline, and it was pointed out that this pipeline is the ONLY one that bypasses Russia, taking Caspian crude to Western access. Apparently, it's been threatened, but not damaged. BP did interrupt/stop the flow of the pipeline for a couple of days, but on Tuesday, this resumed. Russia claims Georgia is using cluster munitions; Georgia claims Russia is using cluster munitions... especially in Gori. It seems a common assumption that Putin is taking full and intentional advantage of the fact that so many are on vacation - in the U.S., in Britain and elsewhere in Europe - as well as the fact that the Olympics provides an ongoing global distraction or "cover." The U.S. is providing humanitarian aid, but it's slow to reach those who are in need, mostly due to logistics (read, chaos). And what is the message from Georgia? The people trust the U.S. and want America to "stop Russia." Meanwhile, Rice tells Russia to quit immediately.